If you’ve been watching the internet marketing world for the past 6 months there’s a very good chance you’ve heard of the SEO tool “Market Samurai“… It’s pretty much come out of the gate as an indispensable addition to any SEOers toolkit. What you probably don’t know is who’s the mastermind behind it? Today, I’d like to put the spotlight on Eugene Ware, one of the key player behind Market Samurai. You’ll rarely hear from Eugene since he’s a “behind the scenes guy” but he’s had more impact on the internet community than most people recognise. Starting out in the early days with Ed Dale, Eugene was instrumental in the development of what has come to be known as the “UnderAchiever Method”… and that’s just the tip of the iceberg. In this interview we covered a whole range of SEO questions, including keyword research and I even asked Eugene why they called their product “market samurai“. So without further ado, it’s my pleasure to introduce one of the sharpest guys in the world of SEO. Click here to download my 1 hour Skype call with Eugene and my Market Samurai Review. As always , it’s free to download, no optin required. PPs. If you’d like to keep up with who I’m interviewing please follow me on twitter and I’ll send you more free interviews and reviews – like this market samurai review. Click here to download Market Samurai. PPs. If you’d like to see another Market Samurai Review… click here to see the video interview I did with Ben Stickland. Market Samurai changed my life. I use it almost every day, from rank tracking to competition analysis. I could not live without it. I agree, Market Samurai is an awesome piece of software. I use it daily and it’s worth MUCH more than I paid for it! Looking forward to listening to the interview with Eugene and thanks for posting it! The one feature I like most with Market Samurai is SEO competition. I can easily find out if I can rank well for a given keyword within a reasonable amount of time. It saves me a lot of time having to do the research manually and separately, which is I think the real essence behind this wonderful tool. I had problems with PC’s and was allowed extra activations. Then, I swapped over to an iMac & Macbook Air and was again allowed activations to cover me at no extra cost. 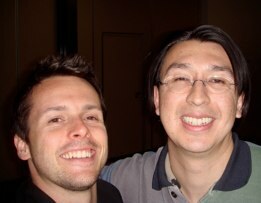 Eugene was in London in 2010 for The Challenge’s conference and I was able to thank him in person. Excellent product and brilliant service.